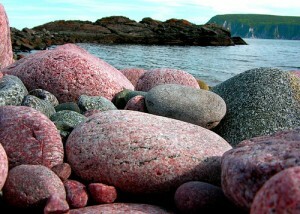 What is in these Nova Scotian rocks? Treasure might be inside. Nova Scotia’s amazing geological history and constant tidal action means the province is a fantastic place to hunt for rocks and fossils. A stroll on the beach might turn up a bit of deep purple amethyst crystal. Then there are agates, jasper, quartz and copper for rockhounders to collect along with countless other minerals, precious and semi-precious stones. This bounty of treasure came from volcanic activity during the Jurassic Period, about 250 million years ago, when a series of eruptions caused the intense heat and pressure necessary to create this assortment. The best part about this activity is that it’s absolutely free. All you need is a hammer, some safety glasses (or turn your eyes away when you crack open the rocks) and a tide table. Because so much rockhounding is done along the shoreline, you don’t want to get trapped by Nova Scotia’s fast-rising tides.